Hey Guys! How was your Monday? Holy Crow was ours busy! Well to start off, both Aaron and I were feeling a bit under weather since yesterday. I'm thinking that shaking hands and giving hugs & kisses to so many people at the graduation party could be the reason. Shut ins like us are so sheltered from germs, and when we finally come in contact with other humans...watch out. I took Emergen-C a few times yesterday. Aaron took it only once. I don't know if it's a testament to it's capabilities but today I'm up and around and he's got that 5th grader sick face on. Anyways...so here's where the real crazy stuff begins. I had mentioned that all of my sister's stuff from Brooklyn was packed to the ceiling of the back porch, and you guys already knew that we were temporarily in the tiny bedroom downstairs. Well, the upstairs master bedroom had been packed with lots and lots of our favorite decor, collections, and art supplies. We'd been waiting on moving up there and playing that game of tetris...moving bedrooms and stuff around. Well in the end we decided to just stay downstairs, since our studio is right next to our current bedroom etc...But that does mean that we're staying in the postage stamp sized bedroom. Ah well...we'll make it work. For major space saving we have to figure out if we can move the washing machine to a little alcove in the hall, thus converting the laundry room into partial studio / storage space. So today was the first day of figuring out what to do with all of our stuff since there are all of these other people who have to occupy this house along with us. Missy & Jason started emptying out the big closet...so lots and lots and lots of boxes needed to come downstairs. I've been missing my blender base since we moved in and I'm hoping I find it tonight. One good part of the chaos was unearthing so many of my favorite things. I'm looking forward to displaying them. Right now they are in piles all over the place down here and it'll be a challenge to find display space for all of it. Of course this is not the ideal set up, but I'll be happy to be surrounded by my most inspirational stuff. I'm hoping to get some Ikea bookcases or shelves for the back wall of the living room. It'll be one giant wall of fabulousness! Ok, so along side the chaos we were also able to get some good stuff done. I mentioned the other day that we were working on some happy, vintagey, summery paintings...well here is a sneak peek...these are totally just the beginning to a handful of things which will include prints and paper packs! For you guys to use in your own projects, scrapbooking, art journals, etc... What do you think? Oh jeez, the house is totally turned upside down right now... it's going to be a long night! Wow! You've had a very full Monday! I've enjoyed a relaxing Monday with a bit of busy added in. Good luck - a chore but fun! Oh wow, that's a lot of stuff you had to do! I love how everything coming out of those plain brown boxes is pretty and pastel :) and those paintings are absolutely gorgeous. It was exactly a year ago that I was in the same situation as you. I moved ALL my things from the house I lived in and collected in for 8 years to NJ to share a life with Sgt. Let me just tell you...moving all your things from your own space into a space you are now sharing with another is not an easy task. I feel your pain! 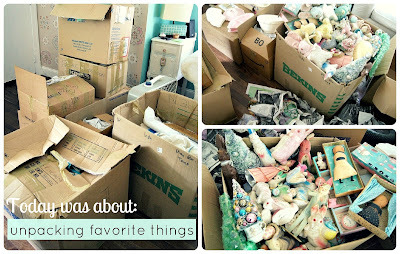 I still have boxes in the garage with hidden treasures yet to be unpacked. Good Lord moving, what a pain in the bum! I am constantly battling a lack of space as well. 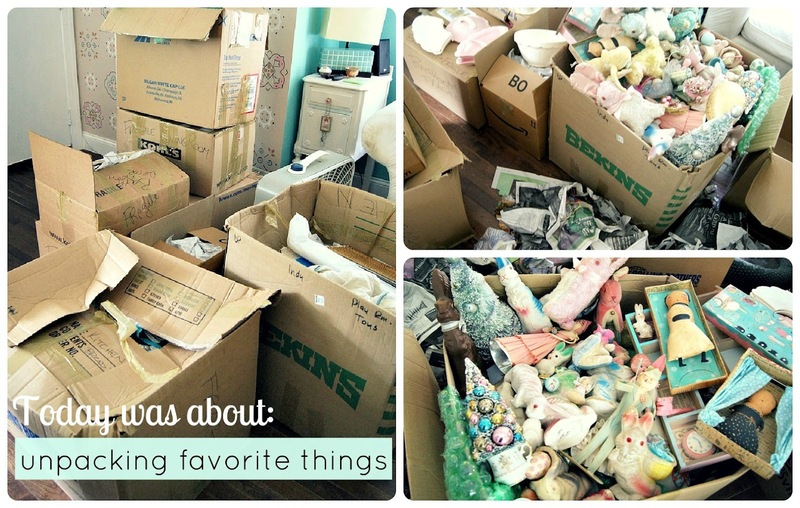 Since one bedroom is a craft room (that is overstuffed at that), there isn't a whole lot of room for other things. Good luck sorting it all out!! I see some familiar stuff there ;) I can't wait to see the finished room! I'm moving around things myself too, the studio is getting way to crowded. Please post pics when you're done! haha...men...haha... Aaron acts as if no one has ever been as sick as he is... oh if they had to deal with CRAMPS! haha! @Welcome to DeluxeVille Oh my gosh yes! You had your fantastic home all set up and perfect..yep...I can totally see how that would have been nuts! Well you guys are seriously making that place amazing! @ Kelsea @ Pink Wonderland Gosh..having great organizational skills is something I so so admire. Have you ever seen that show "Clean House" it used to be on style network...well I would just die over the amazing job the gal that did the organizing did...mind blowing!! 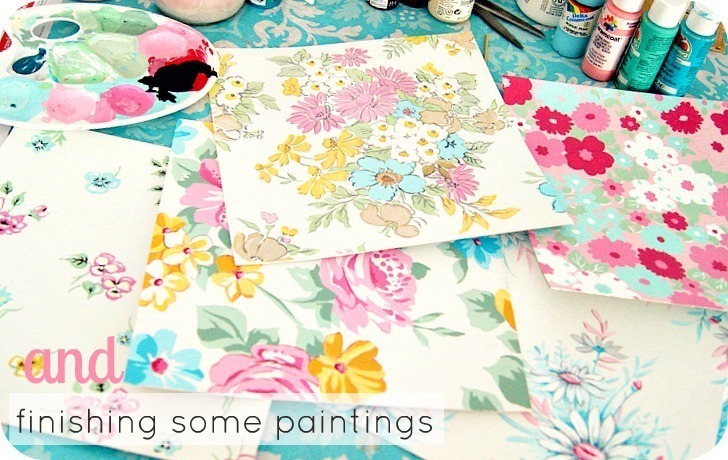 loving the floral paintings. You guys are sooo talented. 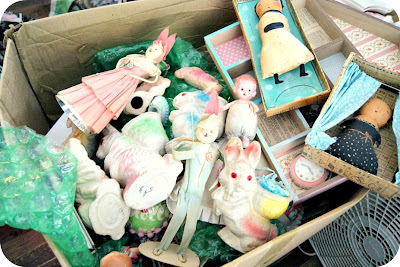 and that box of goodies.. rather then unpacking it, just close it up, write my address on it and send it here! so much cuteness there! have fun moving things around and setting up.. though somewhat stressful, I like setting things out just so! If I lived closer I'd volunteer to help...just so I could stand and gawk at the COLOR inside those boxes! GORGEOUS! And the paintings! Oh my, they're vintage-y goodness makes me swoon! I can't WAIT for them to be made into paper packs...and digital kits too? Mark Monday as SUPER productive...Tuesday deserves ice cream! hope you have a lovely day kisses A.
Hi Jenny! I love all your sweet treasures! Hope you can find enough space to display them all. A wall of shelves sounds perfect! I've always wanted that but haven't had the space in any place I have lived so far. I love the idea of adding some yellow. I adore yellow! It is such a happy color and goes so well with aqua and pink. Your new paintings are SO pretty! I hope you both start feeling better soon. Being under the weather is the worst. And I'm loving those paintings of yours!